Because you are ready for a business breakthrough! Have you tried E.V.E.R.Y.T.H.I.N.G. and still can’t figure out why you are not earning more revenue in your business? Spent a ton in programs, workshops, and online courses and still not getting the results you want? Do you believe that you have what it takes but you are stumbling over something that is holding you back from earning more? 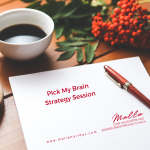 Let me offer a solution - Book a "Pick My Brain Strategy" session! If you are ready to invest in yourself and get the customized answers and a 30 day that plan that will GROW your business, I recommend that you sign up today! Clarity about the steps you need to stop taking or add to increase your revenue. People share with me that I am often able to pinpoint the gaps that are keeping you from earning sales. Increased confidence so you can move forward with ease and less overwhelm. You'll leave with a recording of the session plus my personal notes emailed to you within 24 hours. We won't be able to fix everything. But you'll leave with specific tools that will start mapping out your path. This one-off test-drive call comes with no commitment and it’ll blow your mind with value. You'll get a copy of the call plus my notes from the call. My assistant will send you a scheduling link to book a time slot. You'll also receive a Paypal invoice for $200. Why should I work with you, Malla? I worked with another client to create a 21 day marketing plan for her new business. Rather than relying on her comfort level of word of mouth marketing, we identified several options that would interest her prospective client - and did role plays to help her bridge the gap on the conversations. What if I don't like your answer? If I can't answer your question, I'll refund your money. There is no BS here. But if you don't like the answer, ask yourself why. Is it because there is a truth embedded that you didn't want to hear? Is it something that you've heard before that you didn't do? Or something new that sounds really hard to take on? Either way, this is an investment to support your goals. Consider first trying what was suggested. You might achieve some powerful results!! In case we have difficulty reaching you by email. What is the BIG problem you are experiencing? What is the #1 thing you want to achieve from our session/sessions? Receive our email newsletter packed with hints & tips?